Curious George begins to look through books and wants to read them. His owner teaches him the alphabet by giving him examples of words that begin with each letter. 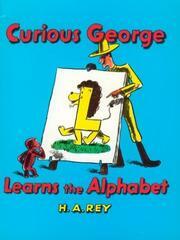 Rey, H.A., “Curious george learns the alphabet,” Children's Picture Book Database at Miami University, accessed April 20, 2019, https://dlp.lib.miamioh.edu/picturebook/items/show/6398.